Sydney Shop Girl: 5000 Poppies. Reflecting. I'm usually able to observe ANZAC Day with some kind of involvement with the formalities of this day of commemoration and respect. Whether it has been watching the ANZAC Day parade on George Street, watching a telecast of the dawn service or pausing for a moment at a memorial - I've always managed to be part of the day. Ironically, on this, the centenary of ANZAC Day, circumstances conspired to make my usual participation impossible. The idiosyncrasies of an ever changing toddler sleep pattern saw me awake through the night attempting to get some sleep on makeshift beds around the house and when sleep finally visited everyone in the household simultaneously, it was dawn. Which meant that our waking up and breakfast routine then rolled on through the ANZAC Parade. So I've been paying my respects informally via the news and images of my social media feeds. 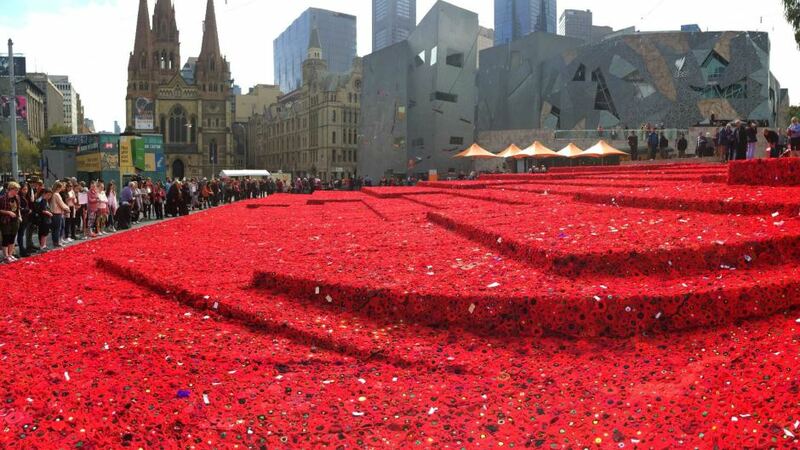 The ANZAC Centenary photos I've used for this post are of the 5000 Poppies project that saw Federation Square blanketed in over 250 000 hand knitted poppies from all over Australia and the world. The poppies have been mounted on special wire frames and the collection will later tour the country. Each poppy has its own story, their creators making a contribution in memory of brave and selfless relatives. I hope that the poppies will be permanently displayed somewhere in Australia for us all to be able to see them and remember the brave fights of the past that give us the present we all enjoy. In honour of the centenary, the weather has blessed us with some spectacular weather today here in Sydney. Toddler SSG and I met up with some of our good friends from mothers group and day care for an hour of sunshine and coffee (priorities, priorities - that should've been coffee and sunshine). Tables at cafes reserved for later bookings - the only place guaranteed to keep toddlers together when waiting for takeaway coffees. There was so much joy and exuberance about being out in the wide open space of the park with the sun shining brilliantly above that it took us quite a while to corral the boys at the cafe simultaneously and then to place our orders. But as mothers of toddler boys we had the collective stern voices and lightening fast reflexes to make it happen. And then we sat in the shade with our coffees and babycinos as the boys traded the snacks we'd all brought from home 'just in case' after they all decided that the mini designer banana cakes from the cafe weren't quite their thing (after their icing had been licked off and all that was left was the boring cake bit). How have you spent ANZAC Day?